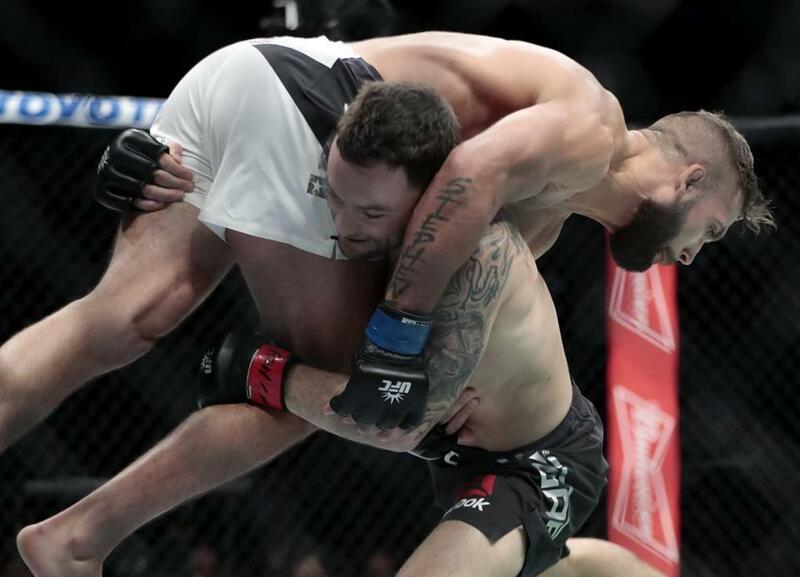 Frankie Edgar lifted Jeremy Stephens during a featherweight bout at UFC 205 at Madison Square Garden. If violence is going out of fashion in sports, nobody’s told the fans. Late last year, a capacity crowd of 20,427 people streamed in Madison Square Garden to witness Ultimate Fighting Championship 205. It was the first major mixed martial arts event to ever be contested in New York City. The stacked fight card drew a record gate and shattered pay-per-view records. For a night, spectators in the nation’s financial and performing arts capital watched eagerly for moves with names such as “guillotines,” “anaconda chokes,” “spinning back fists,” and “hook kicks” — the lingo of a sport that’s a mere quarter-century old and that keeps growing in popularity despite its brutal image, or maybe because of it. The future has won. Fox regularly showcases UFC events, and ESPN covers the sport like any other. MMA athletes are becoming so mainstream that they’re landing movie roles and gigs on “Dancing With the Stars.” A recent swipe from Meryl Streep — who complained at the Golden Globes that an immigration crackdown would wipe out Hollywood and leave behind only football and mixed martial arts — offered backhanded testimony to the sport’s growing profile. Yet questions that dogged mixed martial arts from the outset remain: How much brutality are fans willing to accept in a mainstream sport? And why is such a physically punishing sport attracting so much attention even as other forms of pro athletics, like football and hockey, are bending over backward to protect players from injury, particularly of the concussive variety? The lingering controversy over mixed martial arts exposes a deeper dilemma in all contact sports: Even when fans rationally grasp the risk to individual competitors, we can’t help but feel that hard hits enrich the spectacle. The goal of mixed martial arts is to inflict as much damage on your opponent as possible while taking minimal damage yourself. There are few restrictions — which makes MMA extremely unpredictable. In three or five five-minute rounds, viewers are virtually guaranteed to feel exhilarated, dubious, or guilty. Oddly, because of the brevity of the matches and lack of padding, the sport can be less punishing to the body that other sports, like boxing or football. Still, mixed martial arts feels different. There is a real threat of seeing something terrible at any second — a fighter being choked unconscious or stiffened up by a particularly severe knockout, for example. Fighters have died from their injuries, though not at the highest levels of the sport. Other sports have the real risk of injury or death, NASCAR for instance. But the goal of car racing isn’t to bring other drivers to the edge of consciousness. Do all humans have innate inner aggression that needs to be fed? Is fighting something people want to emulate? Behavioral psychologists have been seeking an answer to that question for years. Albert Bandura’s famous “Bobo Doll Experiment” found that children are far more likely to behave violently if they watch an adult behave violently first. The findings spawned his “social learning theory” — the idea that behavior can be learned just by observing the environment around you without it being reinforced. The theory is often applied to violence in the media like video games and music, but there has been limited research on how it applies to ultimate fighting. To some extent, the fighting organizations are playing a double game. They’ve perfected the art of promoting themselves as a mainstream sport, complete with fighter rankings, betting lines, and fantasy games. Still, in UFC commercials, social media posts, and highlight reels, the brief moments of shocking brutality define the sport more than anything else. When Ronda Rousey, among the sport’s earliest female stars, was knocked out at UFC 193 with a kick to the head, it was a sobering reminder that the flashy sport really is a high-risk venture. Jon Mael is a freelance writer living in Sharon.